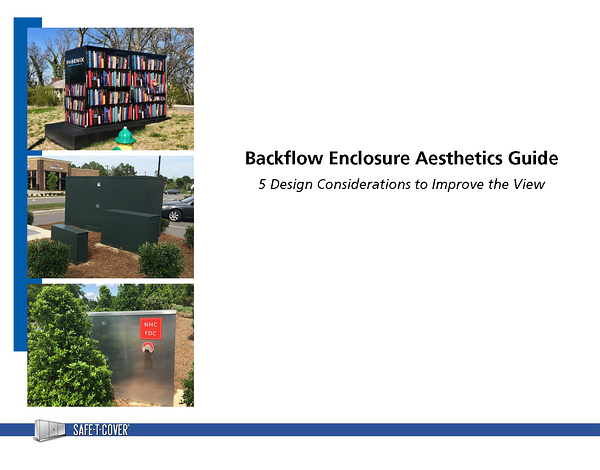 The most common objection we hear about the use of above-ground backflow enclosures is aesthetics. We get it. No one wants another big, shiny box distracting customers from the appearance of a new building. Architects, building owners, and everyone else involved in the decision is under the assumption that backflow enclosures have to be an eye-sore. The problem is that the best location for the backflow device is above ground in an ASSE 1060 enclosure. Backflow devices should not be installed in a vault for risk of a cross connection when the vault floods. RPZs shouldn't be installed inside the building where they could potentially cause significant flooding. So what do you do? Well, this new guide to backflow enclosure aesthetics is here to rescue you. Download the guide to find out how to keep your building looking its best while still maintaining backflow preventer installation best practices. You'll keep your drinking water safe, your backflow preventer protected, and your property beautiful.